Ismail al-Kanon had been held captive for more than a year, and threatened with execution more times than he cared to remember. But this time was different. The people who held him, ISIS fighters, found in his possession a picture of Jesus and two small crosses. They took the items away, burned them, and told him he would be beheaded if they found any more. Ismail could tell they were serious this time. So he took his last cross — the only one they hadn’t found — and hid it very carefully in the back of a cable receiver box. “When I left it there, I told myself the cross is not just around the neck, it’s in the heart,” Ismail, 16, says. It was a small act of defiance — an attempt to retain a part of himself. It was also a symbol of hope. He was telling himself that one day he would be back to collect it. That he would survive. For two years, Ismail and his mother, Jandar Nasi, were captives of ISIS. More than most people living under the group’s rule, they had reason to expect that they would never escape. A cross hangs around Ismail al-Kanon's neck, as he sits in his temporary home in an office building in Erbil, Iraq. For the roughly 100,000 Christians living in northern Iraq, the message was terrifying. 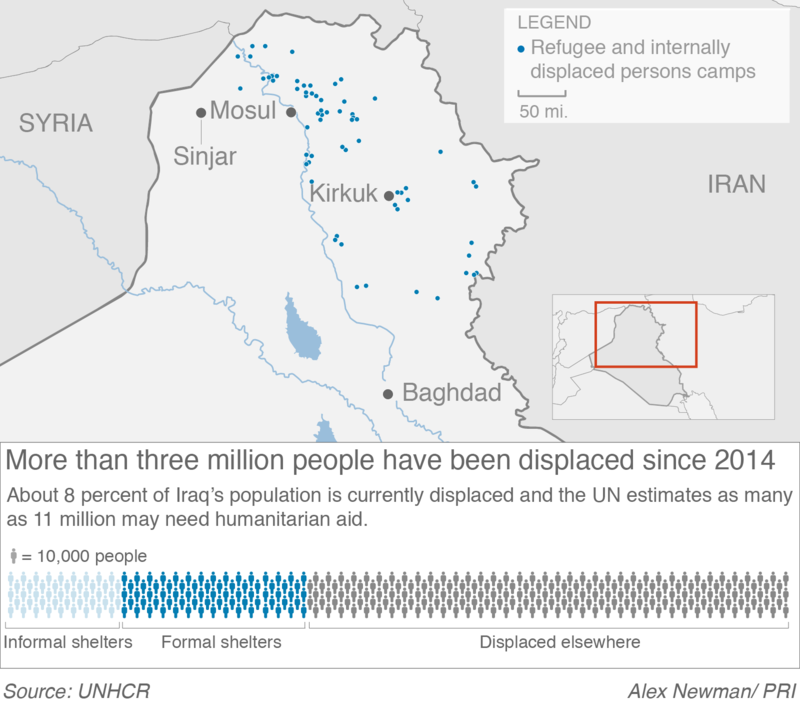 Most fled to the relative safety of the semi-autonomous Kurdish region, along with tens of thousands of Muslims, Kurds and members of the Yazidi religious minority. But not everyone was able to escape. “We’re the only ones who stayed, everybody else left. We had no clue what had happened,” Ismail says. Ismail and Jandar are Chaldean Catholics, the leading Christian denomination in Iraq. They were living in Bartella, a Christian town east of Mosul. The town largely emptied when ISIS made its advance. Ismail’s mother was too sick to travel, so they hid in their home. When they emerged three days later, there was practically nobody in sight. They went to the main road, flagged down a car and asked to go to Erbil, the capital of the Kurdish region. They got as far as a checkpoint in Khazer, midway between Mosul and Erbil. It was manned by armed men with beards. He didn’t know it then, but that was the start of his two-year nightmare. Ismail is a wiry young man, tall and still growing. He comes across as shy at first, but that impression soon gives way when a topic takes him. Aside from video games and computers, the story of how he escaped the clutches of the deadly terror group is one such topic. His is a story of survival, strong will and dedication to his mother, who shared his nightmare with him. It begins with the US invasion of Iraq in 2003, when he was just 3 years old. That year would set in motion a chain of events that still affect Ismail’s life today. Even before ISIS came along, Iraq’s Christian population had been steadily dwindling. 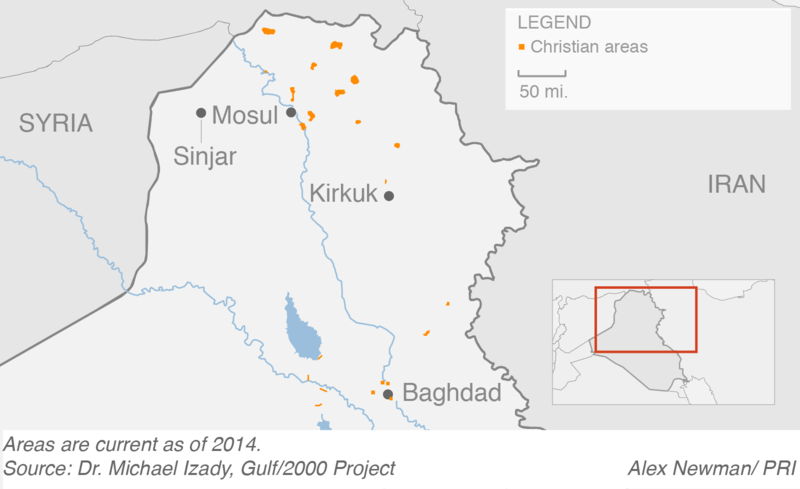 The last census in Iraq — conducted in 1987 — counted 1.4 million Christians. Many were reported to have fled during the 1990s, when US sanctions against the country started to bite. That flight accelerated after 2003, when the US invaded Iraq to remove Saddam Hussein. Extremist groups like al-Qaeda that rose in the chaotic insurgency against US occupation targeted and killed Christians, who left en masse, to Syria, Europe and elsewhere. By 2013, the Christian population of Iraq stood at around 500,000, according to the US Commission on International Religious Freedom, in a country of nearly 40 million people. Church leaders in Iraq put the number today as low as 275,000, the bipartisan government commission said in its annual report. Bartella, where Ismail grew up, retained its Christian identity. It is home to six churches, one of which was right by his home. He helped out during services. His religion was important to him. So when, a few days into his captivity, he was forced to convert to Islam, it hurt him deeply. “One of the ISIS fighters asked us, ‘Why won’t you become Muslims?’ We told him that we didn’t want to. He got angry at me,” Ismail says. While they were thinking, the men went to a cell next door. Ismail could hear everything. A Shiite Muslim man was told to convert to Sunni Islam or he would die. He refused. The militants shot him. “They came and took us to [the man’s corpse] and told us that this would be my fate if we don't convert,” he says. “My mother then said let’s do whatever they want so that they wouldn’t kill me. So we told them yes, we will convert. They asked us to say the shahada and we said it,” he adds, referring to the Muslim profession of faith. The forced conversion would save their lives. But it wasn’t real to them. Ismail still wore a cross under his shirt. Jandar Nasi, a 54-year-old Christian Iraqi who fled ISIS-held Mosul with her son. The pair were moved around between different houses, and kept under a virtual house arrest. ISIS fighters mistreated them horribly. “They would come and check on us every day and teach us the prayers. When we didn't learn their prayer correctly, they would beat us,” Ismail says. He was forced to watch his mother beaten and humiliated many times. “My mother is epileptic. She would learn something then forget it after she had a seizure. They would teach her, then come to her the next day, they would ask her the same question but she wouldn’t know the answer,” he says. Ismail would pass the time playing video games on his laptop. He played “Grand Theft Auto” nearly every day — never in the presence of ISIS fighters. Sometimes he would walk down to the market just to watch people. But he was incredibly lonely. He couldn’t talk to anyone. “I would swim in the river, or go the souks, just to blend in with them. I was too afraid to talk to anyone in case they found out I was Christian and punished me,” he says. His boredom and isolation were punctuated by horror. “During that time they came and arrested me seven times. They would take me from the house and take me to a prison. They would sometimes keep me there for three days. Every time, they would give me 25 lashes, shave my head and then release me,” he says. Ismail and his mother tried to escape often, but each time were caught and punished. Twice, they waited until their minders had gone and convinced a driver to take them out of Mosul. But then they ran into an ISIS checkpoint. He was only 14 when he was captured, but Ismail took on the responsibility of caring for his mother. Jandar, 54, can’t move around much. Today, as they both sit in a small room in an office building in Erbil that’s housing Christian families who fled ISIS, she is happy to be alive. Ismail al-Kanon is interviewed in his home in Erbil, Iraq, on Nov. 25. Ismail watched the news every day. He knew that the Iraqi army was planning an offensive to recapture Mosul, and he wanted to get as close to the battle lines as possible so he could escape. When the fighting came to the city limits, Ismail’s handlers became occupied with combat. Ismail and his mother slipped away from the house they were being held in and found an empty apartment just behind the front line. The neighborhood of Samah was under siege, and the fighting raged all around them. “ISIS were on the roofs of the buildings, they saw us and started shooting at us. They aimed at my mother but [the bullet] went through her robe and didn’t hit her. She could have died,” he says. Despite the risks, they did not want to turn back. “I took a white sheet and wrapped it on a stick, then we ran toward the army,” he says. Finally, after his long punishment, he escaped ISIS territory. He was liberated. “I was in disbelief. I saw the army’s faces, they had no beards, their faces were clear like a shining light. I would see ISIS fighters all the time looking like monkeys, hair all over, they looked like they came from the stone ages,” he says. Ismail and his mother were taken to a camp for displaced people east of Mosul. They stayed there a few days before going to Erbil, where they now live, in an abandoned office building. But Ismail doesn’t feel lucky. His ordeal has taken a huge toll. “I’m mentally and physically tired,” he says. He thinks the cross that he hid is still where he left it. He had meant to go back to get it. Now, he is not so sure if he will. His mother nods silently in agreement. This story is part of the series Iraq Interrupted: stories of survival from Iraqi men and women who have struggled and persevered through more than a decade of conflict. Click here for another profile, of Zikra Younis, an Iraqi woman who escaped ISIS rule and her husband. And click here to meet an Iraqi teacher who was forced to keep teaching with ISIS' revised curriculum.